The Federal Trade Commission enacted the Funeral Rule on April 30, 1984, then provided stiffer enforcement provisions on July 19, 1994. This rule prevents funeral providers from: *Misrepresenting legal, crematory, and cemetery requirements; *Embalming for a fee without permission; *Requiring the purchase of a casket for direct cremation; *Requiring consumers to buy certain funeral goods or services as a condition for furnishing other funeral goods or services; and *Engaging in other deceptive or unfair practices. Funeral providers who violate the Funeral Rule may be subject to penalties of up to $10,000.00 per violation. 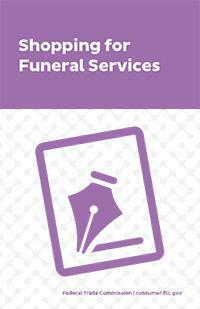 The Funeral Rule requires funeral providers to offer a General Price List. The list itemizes the various goods and services they offer, and how much they cost. Funeral providers must give a General Price List to anyone who inquires about funeral arrangements, including competitors, journalists, and representatives of businesses, religious societies, government agencies, or consumer groups. The General Price List must be offered before the funeral provider begins to discuss: *The type of funeral or disposition that they can arrange; *The specific goods and services that they offer; or *The prices of their goods and services. The funeral provider must physically offer consumers a General Price List that they can keep and take home with them. Funeral providers cannot charge a fee for the General Price List or place any conditions upon giving consumers information that the Funeral Rule requires them to provide. 1. Right of Selection - Consumers have the right to select only the items they want to buy. However, any funeral arrangements a consumer selects will include a charge for basic services and overhead. 2. Embalming - The law does not require embalming, except in certain special cases (not specified in the Funeral Rule). However, embalming may be necessary for certain funeral arrangements, such as a funeral with viewing. Consumers who do not want embalming usually have the right to choose an arrangement that does not require them to pay for it, such as direct cremation or immediate burial. 3. Alternative Containers - Consumers who choose direct cremation can use an alternative container. Alternative containers encase the body and can be made of materials like fiberboard or composition materials (with or without and outside covering). The funeral provider must specify which containers they provide. 4. Basic Services Fee - The funeral consumer has the right to know how much the non-declinable fee for basic services and overhead will be. The consumer does not have the option to decline this charge. 5. Casket Price List - The funeral provider must disclose that a Casket Price List is available. If it is not listed as part of the General Price List, it must be provided before beginning discussion of casket prices. 6. Outer Burial Container Price List - The funeral provider must disclose that a Outer Burial Container Price List is available. If it is not listed as part of the General Price List, it must be provided before beginning discussion of outer burial container prices. If the funeral provider offers a package funeral (with a pre-defined set of some of the services listed above), they must offer the package funeral in addition to and not in place of the required itemized prices. If the consumer obtains funeral goods or services elsewhere, the funeral provider may not charge another non declinable fee, such as a "casket handling fee" or "basic facilities fee". Caskets, vaults, transportation of the remains, embalming, cremation, outer burial containers, and urns are examples of funeral goods or services that can be provided elsewhere. At the end of discussion of funeral arrangements, the funeral provider must give the consumer a completed Statement of Funeral Goods and Services. This is an itemized list of the goods and services that the consumer selected. The statement allows consumers to evaluate their selections and make any desired changes. 1. Embalming - The funeral provider cannot tell consumers that state or local law requires embalming if that is not true. 2. Casket for direct cremation - The funeral provider cannot tell consumers that state or local law requires them to buy a casket if they are arranging a direct cremation. (A direct cremation is one that occurs without any formal viewing of the remains or any visitation or ceremony with the body present.) The funeral provider also must not tell consumers, in the case of direct cremation, that they must buy a casket for any other reason. 4. Legal and Cemetery Requirements - The funeral provider cannot tell consumers that any federal, state or local law or a local cemetery requires them to buy a particular good or service, if that is not true. If they do tell a consumer that he or she must buy a particular item because of any legal, cemetery, or crematory requirement, they must identify and describe the particular requirement in writing. 5. Preservative and protective value claims - The funeral provider cannot make any representation to consumers that funeral goods or services will delay the natural decomposition of human remains for a long term or indefinite time. 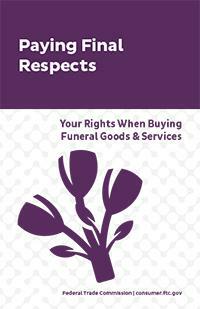 The funeral provider cannot require consumers to buy unwanted or unneeded goods and services that they do not want. Consumers must be able to choose only the goods and services that they want, with certain limited exceptions noted below. The funeral provider cannot condition the furnishing of any funeral good or service except for their basic services fee and any items required by law. The funeral provider cannot refuse to serve a family because they do not purchase one particular item (e.g., a casket or embalming) or a combination of items or services. The funeral provider cannot include the charge for an optional item of service (such as embalming) in a non-declinable basic services fee. This would have the effect of making the optional item a required purchase for every customer. The Funeral Rule expressly prohibits a funeral provider from charging any fee, as a condition of furnishing any funeral goods or services, other than the fees for: *The basic services of funeral director and staff (the one non-declinable fee allowed by the rule); *The funeral goods and services requested by the consumer; and *the funeral goods and services required by law (or by the cemetery or crematory). The funeral provider cannot charge an additional fee or surcharge to consumers who purchase a casket elsewhere. Such a fee would not fall within the three categories of allowable charges listed above. This extra "casket handling" fee is simply a hidden penalty for those consumers who exercise their right to purchase a casket from another seller. The funeral provider cannot alter their prices based upon the particular selections of each customer. Such a practice also would defeat the purpose of the Funeral Rule to give people accurate, itemized price information that affords them the opportunity to select the arrangements they want. Exceptions: The three exceptions to the consumer's general right to choose only the goods and services wanted are: *The one non-declinable basic services fee; *Items required by law (or by the cemetery or crematory); and *Impossible, impractical or excessively burdensome requests. The funeral provider does not have to comply with such requests. However, they cannot refuse a request simply because they don't like it or don't approve of it. Note: If a customer requests an item that the funeral provider does not normally offer, they do not have to comply with the request. However, they are free to do so. Source: Complying with the Funeral Rule, A business guide produced by the Federal Trade Commission.